I love oatmeal for breakfast on cold mornings! This morning I made a bowl and added some of the Caramel Vanilla Creamer I made earlier this week and threw in a handful of roasted almonds. mmm.mmm.mmm. .Im getting side-tracked. As I was eating my oatmeal I got to thinking about how great oatmeal is! I recently saw an idea for making Herbal Bath and Shower Bags at Tipnut.com and couldnt wait to try making my own version using oatmeal. I love how oatmeal makes your skin feel after soaking in it, but its not always practical (or economical) to fill up the bathtub to get those benefits. Thats where the BAG comes in. Just fill a small cloth bag with oatmeal, a little grated soap, and a few drops of your favorite essential oils and you have the benefits of an oatmeal bath that you can take into the shower with you! Plus, the cloth from the bag will provide a light scrubbing action to help clean and exfoliate your skin. You can make drawstring pouches out of cheesecloth, organza, muslin, or whatever you have on hand. Or you can CHEAT like I did and pick up some of these little organza favor bags I found in the wedding/cake decorating section at Walmart. (I think it was around $2.00 for 12.) These turned out to be the perfect size! Just big enough to hold between 1/4 to 1/2 cup of the mix. To make the oatmeal mix: add 2 cups of rolled oats, approximately 1/2 bar of grated soap (I happened to have some Lavender soap on hand), and 5  10 drops of essential oil to a bowl and mix together with a spoon. You could also add dried herbs if you like. 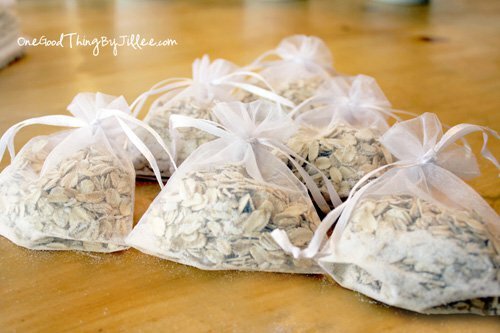 Spoon the oatmeal mixture into the bags until they are about 3/4s full, then simply pull the drawstring tight and tie a double knot. This ended up making about 8 bags (only 6 are pictured). Store the bags in an airtight container until ready to use. After use, you can hang them to dry on a hook in the shower or bathroom, or, when they have lost their oomph, empty the pouches, rinse them out, allow to dry and then refill and reuse. .these would be great to throw into a FOOT bath as well. What do you think?? ?